How Funny? – He Said What?! What a difference a day makes! Aaron has been very happy today. He and I have both laughed at some of his antics, and I’ve laughed at some of the things he has said. I don’t know if it’s good night’s sleep he had; the seizure he had at 2:30 this morning that rearranged some of those neurons; looking forward to his trip to the mall today and the food fest that usually occurs; or a change in the weather that’s on the way…………but he’s been happy and lots of fun this morning. It began when I went into his room to get him out of bed………..and his bed was empty. He hasn’t played this trick in awhile, but I know what an empty bed and closed door usually means. It means that Aaron is hiding from me, just like a kid would do. It didn’t take me long to figure out that he was hiding in his closet because the door was slightly ajar………..and Aaron never allows the door to be partly open, even a crack. So I opened the door and there he was, laying on the floor like someone in a crime scene. 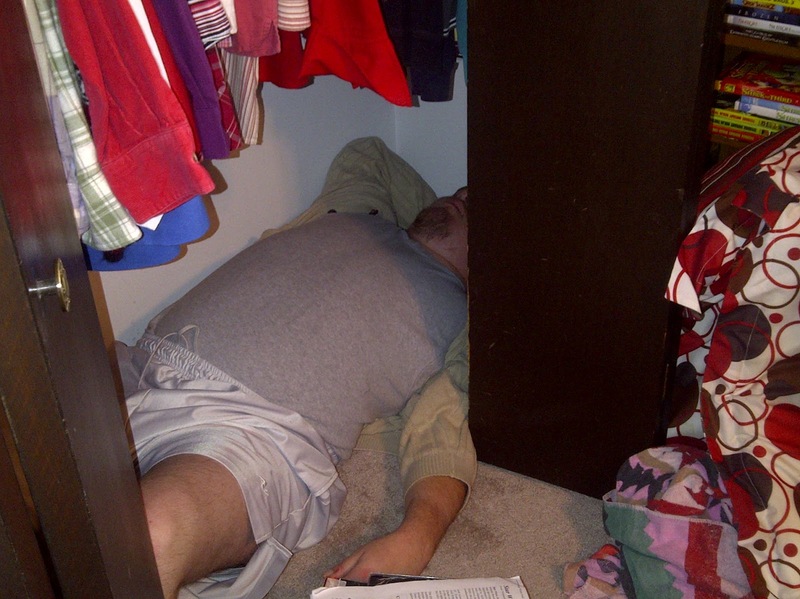 He was very droll about this unusual sight of a grown man crammed into a little closet, laying on the floor, but he was also very pleased with himself for his brilliant hiding place. No, Aaron, it wasn’t funny. It was scary that you fell. There he goes with that half business again, which makes him totally funny to me………..and I laughed and he wondered what I thought was so funny as I patted his leg………….and told him that HE’S the funny one. No response, as usual, to that comment. The country cop? So as I dropped Aaron off I’m still not sure if the country cop is the state policeman or the sheriff……………because Aaron hasn’t quite figured this out yet. And as usual, I’m trying to figure Aaron out as well as country cops. I have the whole day ahead to do this! And that’s a good thing. Previous Previous post: Throw ON the Towel!